Some of the most common reasons for not getting active and exercising are gym memberships and fitness equipment being inaccessible and too expensive. Many companies however are challenging the traditional high cost health club notion with low cost exercise alternative. Following the success of Sports Direct £5 per month gym memberships Poundland have launched a 37 piece range of fitness and exercise equipment by ActivLife for £1. The large range will have something for everyone, from those looking to hit the weights hard to those looking to balance on their heads in yoga. 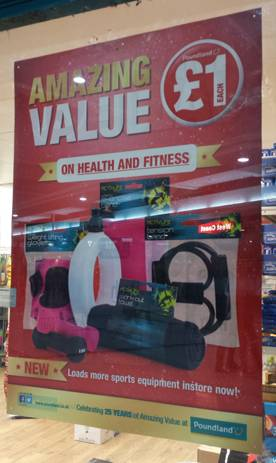 The range includes free weights, weight gloves, skipping ropes, yoga mats, workout towels and gym bags all for £1 each. The range also include protein shakes, protein bars, water bottles and protein shakers by ProteinActive as nutrition is more than half the battle when staying active and keeping your nutrition on track. All this low cost fitness equipment will hopefully increase participation in sport and exercise, which in turn can reduce inactivity and obesity levels in the country, both of which have recently been reported as an increasing problem in the UK. It looks like low cost alternatives will continue to grow as other budget stores such as Primark recently increased their exercise clothing and equipment range. So the excuse of exercise costing too much or being inaccessible is on the way out, as the cost of exercising is still going down. You can set up a home gym for less than a fiver and workout in the comfort of your own home thanks to Poundland.